Weimaraner Dogs - The Weimaraner is a silver-grey breed of dog developed originally both for tracking game, such as birds, and as a pointing breed. The name comes from the Grand Duke of Weimar, Charles August, whose court enjoyed hunting. The Weimaraner is elegant, noble, and athletic in appearance. This breed's short, smooth silvery-gray coat and its unusual eyes give it a regal appearance different from any other breed, and has nicknames of "silver ghost" and "gray ghost". This information is licensed under the GNU Free Documentation License. It uses material from the Weimaraner article on Wikipedia.org. Weimaraner Breeders - Advertise your kennel puppies and dogs here. Freehart's Weimaraners - California - Breeding quality since 1986. Silver grey, pups are raised indoors, and socialized daily. 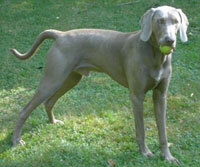 We are located 40 minutes from L.A.
FoxFire Weimaraners - Colorada - Home of champion and specialty winning Weimaraners. Donna's Darlins - Georgia - We are a family owned & operated Kennel. We raise quality Weims at reasonable rates. We encourage anyone to come out & check. Copyright © 2004 - 2019 FindAPureBred.com. All Rights Reserved.